my big fat chinese wedding: Celebrate carbs and calories! 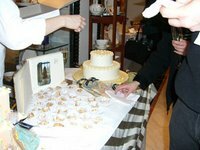 The "Celebrate the Cake" at Michael C. Fina was an interesting cake-tasting experience. They are sort of like a high-end department store with jewelry and watch displays upstairs and home goods like cookware and china downstairs. I think they also do invitations for special events. After we checked in, they gave us drink tickets to pick up champagne or water, which was nice. There were eight cake designers/bakers there. Our first stop was Martin Howard, the pastry chef at Brasserie 8 1/2. Since this was the first one, I remember it most vividly. The sample was a vanilla cake with triple berry mousse and buttercream frosting, which was sooooo good! The berry mousse was very intense and multi-dimensional and the cake was moist. Just thinking about it gives me shivers!! Unfortunately the cakes start at $10/slice(!) and his designs are a little too obtuse for me (hence I did not take a picture). Next up was The Cake Studio. I liked that they were thoughtful enough to present nice trays of mini cupcakes for everyone so it wasn't as messy to slice (but it ended up being messy for the tasters b/c the thick frosting really got in the way when trying to remove the cake liner). The person manning the stand was a little snooty b/c when she saw me taking pictures, she told me not to show them to any designers (the designs weren't that nice anyway). 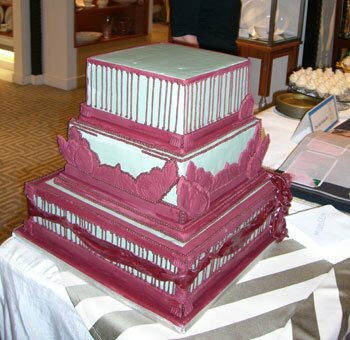 Their cakes were super rich: The first one I tried was a red velvet, which was really sweet and a little too heavy for me. The other one was coconut something or other and not very memorable. I couldn't finish these cakes and had to chuck them. 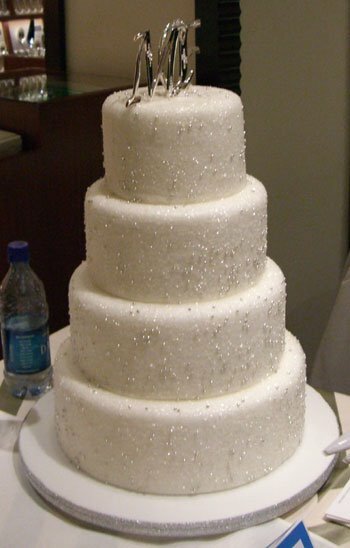 I think their cakes start at $10/slice and they also don't do sheet cakes on the side so it'd be a very expensive (and big) tiered cake for us. I am a little hesitant to post pics of their cakes but b/c I'm keeping this blog for remembrance's sake (and I'm not showing it to any designers), I will. Sweet Melissa Patisserie next door was alright. I liked how they had these pretty cookies on display (a sample of what to give out for favors, I guess). Their cake sample was some sort of a cream puff, which I didn't really care for and a chocolate thing which I didn't try b/c we're not going for any sort of a chocolate cake. 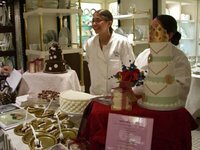 Their buttercream cakes start at $8 and fondant, $9. I was surprised to see Ferrara, from Little Italy, there. They had a very traditional tiered white cake on display and a gigantic sheet cake for tasting. They gave huge slices of raspberry and chocolate mousse cake, with big bowls of other fillings that they offer on the side. The raspberry mousse was not as good as the triple berry one from Mr. Howard, but their prices are right: $5.50 for tiered cakes and $1.50 for sheet cakes, where sheet cakes feed 120. I think they don't do fondant and I think I tasted lemon too, which I didn't like. 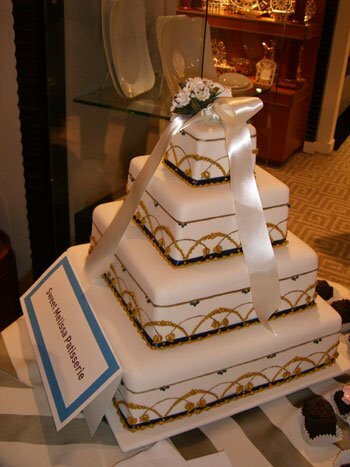 Then there were some gorgeous, but crazy expensive cakes from the Sugar Room (Juan Arache). Someone said, and I kinda agree with them, they're so beautiful you don't want to eat it for fear of ruining it. I'm not so sure that's a good thing b/c I want guests' mouths to water at the thought of eating the cake, not afraid to eat it. I didn't try their cake b/c it was chocolate. 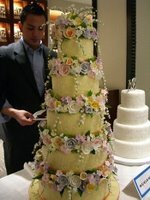 I think they were $15/slice for the really fancy one w/ the sugar flowers. 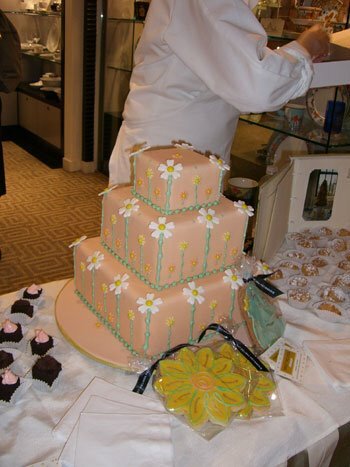 Cakeline (Cynthia Peithman) had a sample of white cake with pistachio and strawberry fillings. I didn't really like the pistachio but it had a nice green color. The strawberry was alright. I thought her cakes were pretty though (see right). Michele Brown Baking was our last stop. 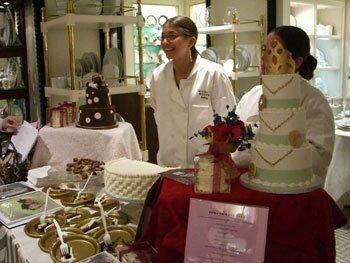 I don't remember what her sample was but it's interesting that she offers demo classes at her bakery (too bad it's in Glen Cove). She charges $6/slice (starting?) 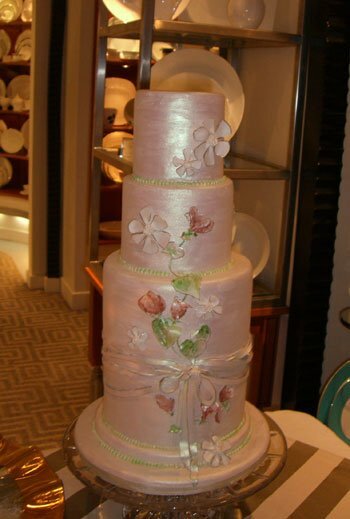 for tiered buttercream cakes and $2 more for fondant. 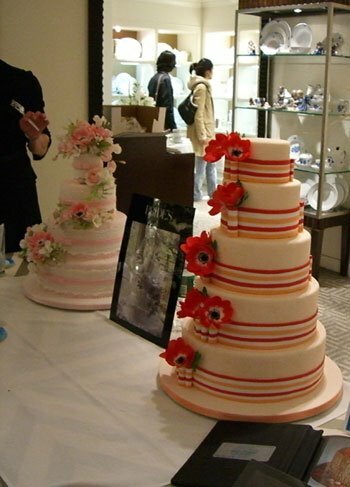 We did not even stop at the last place, Cake Diva, b/c their cakes were kinda ugly and they seemed to be groom's cakes, which we're totally not doing. Plus I was so stuffed! At the beginning, while we waited for some friends (they're getting married in June!) to get their drinks, we were accosted by a "Registry Specialist." I shouldn't use such a strong word like accosted b/c the man was actually very nice and he really made me consider registering with them (especially since they have Le Creuset!). He said that he would guide us on creating a registry, which is what I think we kinda need b/c we have no idea. We're probably missing all the crucial things out there and we're probably going to end up with a stocked kitchen and nothing else. But I'm not so crazy about such a 'specialized' store (there are only 2 in NYC, one of which is in Brooklyn and not as fully stocked as the one on Fifth Ave.) b/c in order to buy stuff from them you have to trek all the way there (I think he said their online registry is not as good as their store).